Starbucks serves wine. Who knew… Well, probably a lot of people that have the fancy new level of Starbucks in their neighborhood. The type that now wine and dinners. I found out about it on vacation. 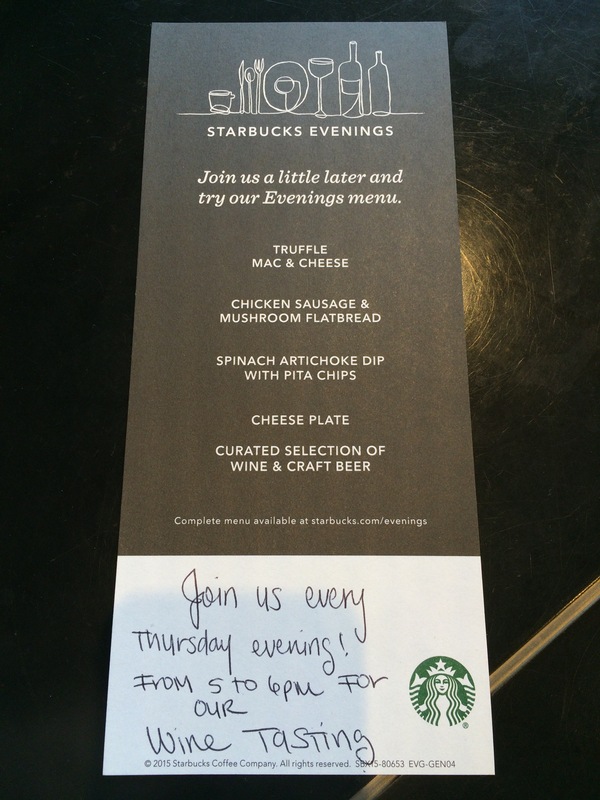 Here’s a neat trick… Starbucks at Disney Springs created their menu in the form a flier. You can take it home, hang on your fridge! It’s a great reminder of their evening food selections. This is a super idea for any take out restaurant and it’s been done for years. Look at the bottom of the photo. They left a blank white space so someone (with good handwriting, definitely not me) but someone could use this special place to write a personal note. The menu I grabbed talked about “every Thursday” having a wine tasting. You’d think with an “every” type of occurrence they could just print the same message on every card. But isn’t it a little refreshing to have a hand written reminder? I think it is. It really personalizes the visit. Try it… If you’ve got a flier with a “bring them back” type of message, (like a menu or rental prices) leave a portion blank to hand write a special note. It could even be a great way for your waitstaff to write a “come back soon” message. Try handing one out when your customer receives their final receipt. I wish those Starbucks stores were here in MN. Love the menu choices!